CONSTRUCTION firms will get more funding for productivity improvements but will also need to adopt more labour-efficient designs when bidding for new projects starting July. These measures are aimed at helping the construction industry, particularly smaller firms, become more efficient and sustainable, said Senior Minister of State for National Development Lee Yi Shyan yesterday. Calling the next three years a "crucial transition period" for the industry, Mr Lee said firms will have to mechanise, automate and streamline workflow for higher productivity. He was responding to questions from Dr Teo Ho Pin (Bukit Panjang) and Mr Charles Chong (Joo Chiat). He explained the need to further cut man-year entitlement quotas - which set the total number of foreign workers a main contractor can hire based on the project's value - for new projects this July, as the built environment sector, on average, has accounted for more than half the annual foreign worker growth. "But we must be careful not to allow the tight labour market to affect the timely delivery and quality of our key public projects", including new Build-To-Order flats and more train lines, he said. To help the construction industry transit successfully, the Government will raise its co-funding level for two schemes under the $250 million Construction Productivity and Capability Fund set up in 2010. Some $85 million has been committed to 2,300 firms, of which over 80 per cent are small companies. Mr Lee said the Government's co-funding will rise from 50 per cent to 70 per cent for both the Mechanisation Credit (Mech C) scheme and the Productivity Improvement Project (PIP) scheme, for companies that can raise productivity by at least 30 per cent. The PIP funding cap for firm-level projects will go up from $100,000 to $300,000. At the industry level, applicants using technologies that raise productivity by 40 per cent and are "game-changing" will get PIP funding of up to $5 million. Contractors welcomed these measures, though some said new equipment must be coupled with more training to see productivity gains. Mr Choo Tat Jin, Kimly Construction project director, was grateful for the extra funds as his firm has already spent almost $300,000 on precast moulds for every project. Contractors who successfully refer their smaller sub-contractors to Mech C programmes will also get a $20,000 credit. New projects must also have higher buildability and constructability scores, meaning designs must be easier to construct and save labour. It will go up three points this July, and another two points by next July. 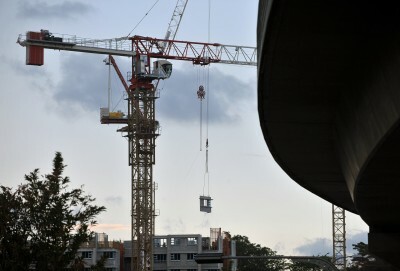 Higher scores in these areas can give contractors an edge in tender bids, Mr Lee said. This will apply to all public sector projects and some private sector ones such as those stemming from government land sales. Mr Ong Soo Kiat, project director at SH Design & Build which builds warehouses and factories, said the higher standards would make it tougher for smaller outfits to compete, given the limited resources at their disposal. For more news and analysis on Singapore Budget 2013, click here for ST's Big Story coverage.